Lately we've seen several inspiring examples of tranquil, private tea houses pop up all over the globe. A1 Architects have constructed this beautiful Black Tea House at the edge of a family’s property in Česká Lípa, Czech Republic. Perched on the edge of a pine forest, the tea house features sliding doors that open to give visitors a view of the forest and nearby lake. The tea house is constructed of natural and sustainable materials and designed to integrate into the surrounding landscape. The building consists of a sheltered patio area and an inner chamber made from smooth timber. The larch wood on the outside has been charred, giving it a gorgeous blackened color without the use of paints or dyes. A viewing patio gives visitors a serene view of the forest and lake from three sides. The interior chamber walls are rounded and clad in clay plaster, and three bamboo flower vases are set into the walls. The sliding doors allow the visitor to adjust the level of light and privacy inside the tea house while changing the view of the lake and trees. A gilded oculus illuminates the interior when the doors are closed. A rope hangs from the oculus bearing the teapot, which rests in a square chamber in the tea house floor. The conical ceiling woven with natural sisal ropes radiates out from the oculus. 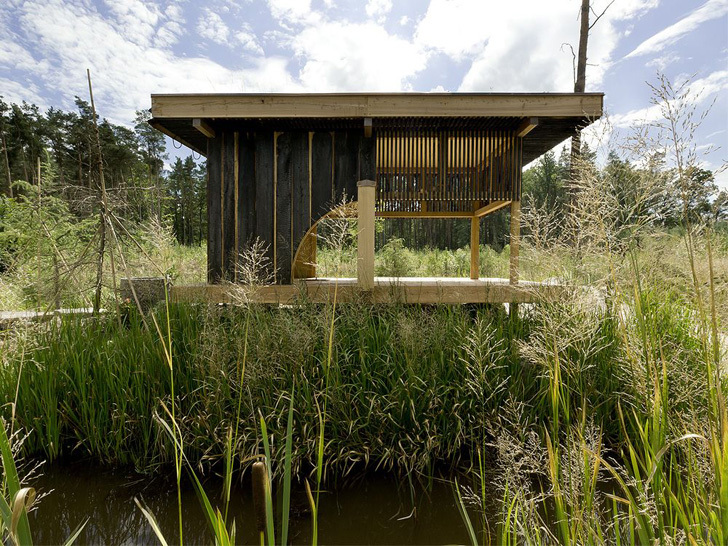 A1 Architects planted the roof with grassy plant life found around the lake to blend the tea house into its surroundings while keeping the interior peacefully cool. 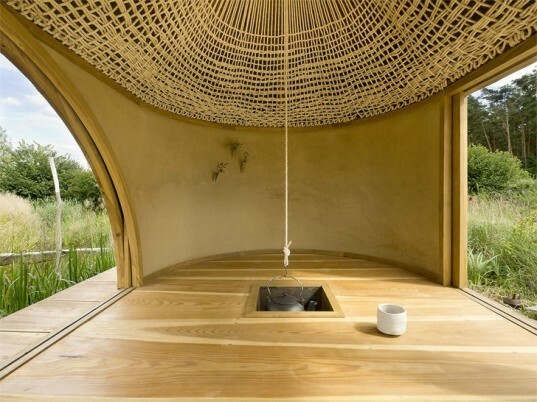 The tea house is constructed of natural and sustainable materials and designed to integrate into the surrounding landscape. The building consists of a sheltered patio area and an inner chamber made from smooth timber. The larch wood on the outside has been charred, giving it a gorgeous blackened color without the use of paints or dyes. A viewing patio gives visitors a serene view of the forest and lake from three sides. The interior chamber walls are rounded and clad in clay plaster, and three bamboo flower vases are set into the walls. The sliding doors allow the visitor to adjust the level of light and privacy inside the tea house while changing the view of the lake and trees. A gilded oculus illuminates the interior when the doors are closed. A rope hangs from the oculus bearing the tea pot, which rests in a square chamber in the tea house floor. The conical ceiling woven with natural sisal ropes radiates out from the oculus.